The gold suns set against a black background symbolize the quest for wisdom and truth in the sometimes dark times in which we live. In universal terms, this can be seen in the eternal combat between good and evil, between positive and negative – a battle that has confronted man since his existence. The three-towered castle is from the arms of the former province of Poitou, inhabited by Mr. Vachon's ancestor Paul Vachon, a notary by profession and mason by trade. The castle's enflamed gate or portcullis symbolizes the instrument of torture used on St. Lawrence: a gridiron propped above a bed of burning coals on which he was martyred. 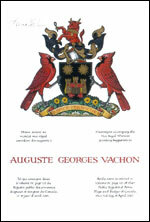 This gridiron refers to the badge and title of Saint-Laurent Herald held by Auguste Vachon from 1988 to 2000. The steer (vache) is an allusion to the name Vachon. The cowbell reinforces this reference. The wreath of oak leaves around the steer's neck refers to the family name of his wife, Gornescu, from the Romanian gorun, denoting a variety of oak. The magnifying glass represents 21 years of employment at the National Archives of Canada and Mr. Vachon's passion for detailed research. Cardinals are among the most colourful birds using the feeder in the Vachon backyard. Along the same lines as the motto, this bird surveys his surroundings very carefully before coming to get food. The yellow daisies on the grassy mound recall the pretty bouquets of these flowers on the farm in Northern Ontario's Sturgeon Falls, Mr. Vachon's birthplace. ASPICE PERSPICUE, meaning "to see clearly", refers to the light in the darkness and is an invitation to see clearly before acting in complex and difficult situations. 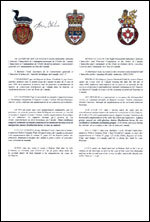 The announcement of the Letters Patent was made on November 3, 2001, in Volume 135, page 4057 of the Canada Gazette. One or more entries related to this Recipient's emblems appear elsewhere in the Register: Volume II, p. 153.